The ten-odd days of vacation around New Year in Russia are a wonderful time to de-stress and recharge sagging winter spirits. For many outsiders, the novelty of the New Year’s Eve festivities in Russia often wears down after a couple of years. The holiday has been so over-commercialized in the country that the lengths that many go to “get everything right” can be annoying. Emotions fly high before the clock strikes midnight and it’s not uncommon for break-ups to happen on the 31st of December. There’s the belief that if the New Year doesn’t get off to a perfect start then the year itself may not be that good. As someone who has a mixed bag of New Year’s Eve experiences in Russia, I can vouch for the fact that such talk is ridiculous. My favourite part of the extended New Year Celebration is the long break that accompanies it. Coming from a country where banks are open on January 1 and life seems to be completely back to normal a day later, the 10-odd days of vacation can be an absolute blessing. There isn’t a better feeling than to go on an ice-fishing trip on the Sea of Okhotsk knowing that the next working day is over a week away. It’s blissful to skate on an outdoor ice-skating rink on a sunny winter day or just take a walk in the snowy woods. I also love to have a warm cup of tea indoors, dressed as I would be in the tropics, and look at the beautiful reflection of the sunlight on freshly fallen snow. The complete shutdown of life in Russia during the New Year break is comparable to the period in China following the Lunar Festival and to an extent Europe after the 15th of August, when everyone seems to be away on vacation. Of course, there is a huge difference in weather between the last 2 weeks of August in Europe and the first 10 days of January in Russia. If you’re not a fan of winter sports, the break can seem endless with some people actually yearning to get back to the office. What I love about these days is the absolute serenity that you see across Russia, whether in small towns or the big cities. Just for around a fortnight, there isn’t that heaviness in the air. It’s a period of absolute de-stressing and of contemplation. The break is a time that is used (once all the hangovers are gone) to build up strength and energy to last out the winter, the worst of which in many parts of Russia, is in January and February. 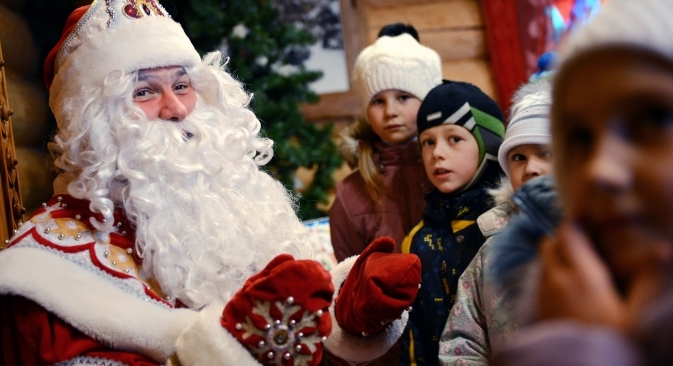 The gift-giving usually takes place during the New Year, but the Russian Christmas is none the less a special holiday. Unlike the New Year, Christmas is not commercialised and is still a private family occasion. For those who have dreamt of White Christmases, chances are that you won’t miss one if you are in Russia on January 7. Since many people combine the New Year break with a holiday to warmer shores, the relaxed feel of the big cities lasts at least until the Orthodox New Year, January 14. It’s too bad these holidays don’t last all the way till then, but then industrial productivity in the country would fall by 40 percent in January instead of the usual 25-odd percent. What I loved about each of my long New Year breaks in Russia was the simple fact that I could appreciate the Russian winter in its purest form. It’s sheer bliss to enjoy the beauty of the winter and be one with nature, not worrying about deadlines or pending tasks that have to be done at work. I have always been the last one to complain when temperatures fall to 30 degrees below zero, but then maybe the urge to flee the hot tropics ever so often played a role in my embrace of the Great Cold North.